The Dayton Arab American Forum invites you to join us for dinner and dancing in celebration of 26 amazing years of serving Dayton! 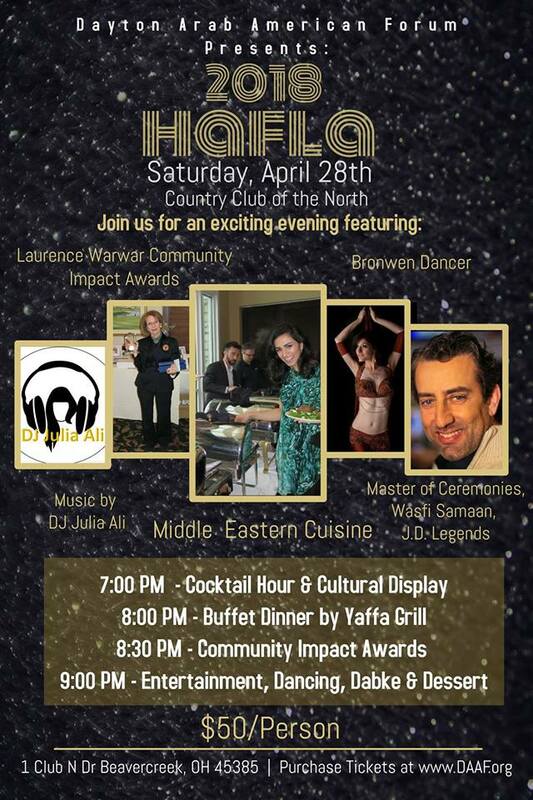 Featuring a delicious Middle Eastern dinner by Yaffa Grill, dance music by DJ Julia Ali, the Laurence Warwar Community Impact Awards, a hookah bar and more! SPACE IS LIMITED and payment must be received before the event begins. All reservations must be prepaid— none will be accepted at the door. As a 501(c)(3) nonprofit organization, your sponsorship is considered tax deductible as allowed by law. sponsorship packages are always available.